N. Gaifyllia, licensed to About.com, Inc.
For the purpose of this photo step-by-step, the recipe for Custard-Filled Phyllo Rolls is being used. 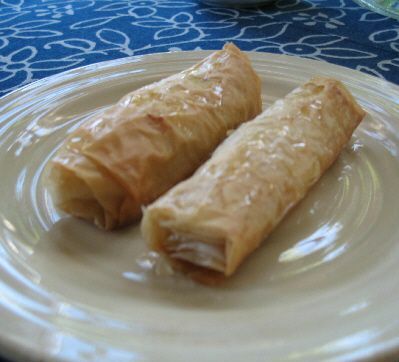 This is an adaptation of the famous and fabulous recipe for Galaktoboureko; however, the rolls can be filled with many of the wonderful fillings used in Greek filled phyllo pies. Defrost the phyllo dough in the refrigerator the day before. Bring the phyllo to room temperature before beginning, and do not open the package until the filling has been prepared and you're ready to start making the pastry. When you do open it, keep unused portion covered with a piece of waxed paper or plastic wrap and a cool damp towel. Make sure your hands are dry when handling. Fold the sheet in half across the length. Brush the top lightly with butter or oil. Place filling (about 2 to 2 1/2 tablespoonfuls) across the bottom of the phyllo (shorter side), about 1 inch in from the bottom and 1 1/2 to 2 inches in from the sides. Fold the phyllo up over the filling from the bottom, and roll up two or three times. Fold in one side of the phyllo. Fold the other side in to create a straight channel for rolling. Note: Rolling it up two or three times before folding the sides in will help prevent the custard from breaking through the phyllo as it cooks. Roll the pastry up into a packet. If it looks as though the phyllo is stressing (which may cause it to break), lightly brush with oil or butter (depending on the recipe). Place the completed filled roll in a non-stick, oiled, or buttered (per recipe) baking pan with the open end down. Place filled rolls closely together (do not squash) in the baking pan, brush with oil or butter according to recipe directions, and bake.